It sounds like there's been a search for scapegoats among the supporters of some losing candidates in last week's election. It didn't take long for the blame to be laid at two pairs of feet clad in big steel-toed firefighter boots: those of candidate Dave Hafner (for promoting the write-in candidacies of Smart and Rokke) and, in the background behind him, outgoing councilmember Erik Hjelle. Check out this image, brought to my attention by a friend who spotted it on North Saint Paul resident Bob Zick's cable access TV show the night after the election. Zick had been attacking Mr. Hafner for "going back on his word" by not supporting Longrie and Cave and having the audacity to criticize ("disparage") the incumbent mayor, etc. Then he welcomed a caller with uncomplimentary remarks about Mr. Hafner's abilities as a firefighter/EMT. 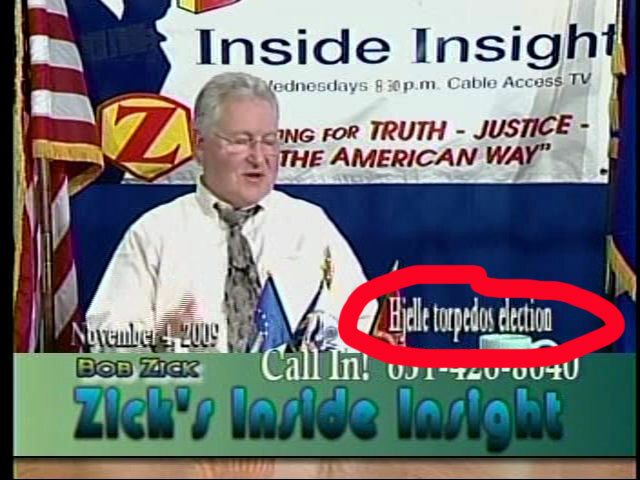 The phrase "Hjelle torpedos election" started appearing on the screen, as you can see circled in the framegrab above. Given his history with both of them, one might have wondered, in the fracturing of the Longrie-Hjelle alliance, which side Mr. Zick would come down on. I guess he decided to stick with the failed politician who is hinting at running for office again, rather than the one who's taking his ball and going home.